for Volume 3, Issue 1! Required Format: Times Roman 12pt. All prose should be double-spaced. Poetry should be single-spaced. Include a brief (100 word) bio with your submission. Ponder Review does not accept previously published material nor does it accept multiple submissions per issue. Simultaneous submissions are accepted, but contact Ponder Review immediately if your work has been accepted for publication elsewhere. Do not withdraw your entire submission unless you no longer want Ponder Review to consider it; instead send us an edit request if part of your submission was accepted elsewhere. Failure to follow these guidelines will result in your submission being denied. Please make all submissions through Submittable. Ponder Review will notify writers and artists of their submission status via email. The reading and acceptance process can take up to 4 months. 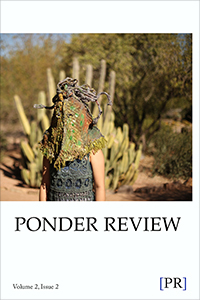 By submitting, writers grant Ponder Review permission to publish their work and acknowledge that Ponder Review is currently a non-paying market. Ponder Review requires first-time North American publishing rights and retains the right to reprint accepted submissions in subsequent anthologies even after publication rights have reverted back to author. Accepted work is subject for use in any future anthologies, both digital and print, and Ponder Review asks that any reprints give first publication credit to Ponder Review. Students and alumni of Mississippi University for Women’s MFA program in creative writing may not submit to Ponder Review for at least 5 years from their time in the program. Buy the most recent issue or purchase a subscription! Purchase a single copy or a subscription. For extra copies of a single issue, select the add-on fee for the number you want. Hint: Add add-on payments together to get the number you want. Submitters to this issue will receive a link to a discounted purchase with the response to their submission. If you want to send 2 or 3 subscriptions of the same year to different address, choose 2-Year or 3-Year Subscription and enter the other addresses in the Special Instructions field. Postage to countries other than the US, Canada, and Mexico is extra. Please add the appropriate amount to your purchase.